Misc 5	Show that the normal at any point to the curve x = a cos + a sin , y = a sin a cos is at a constant distance from the origin. 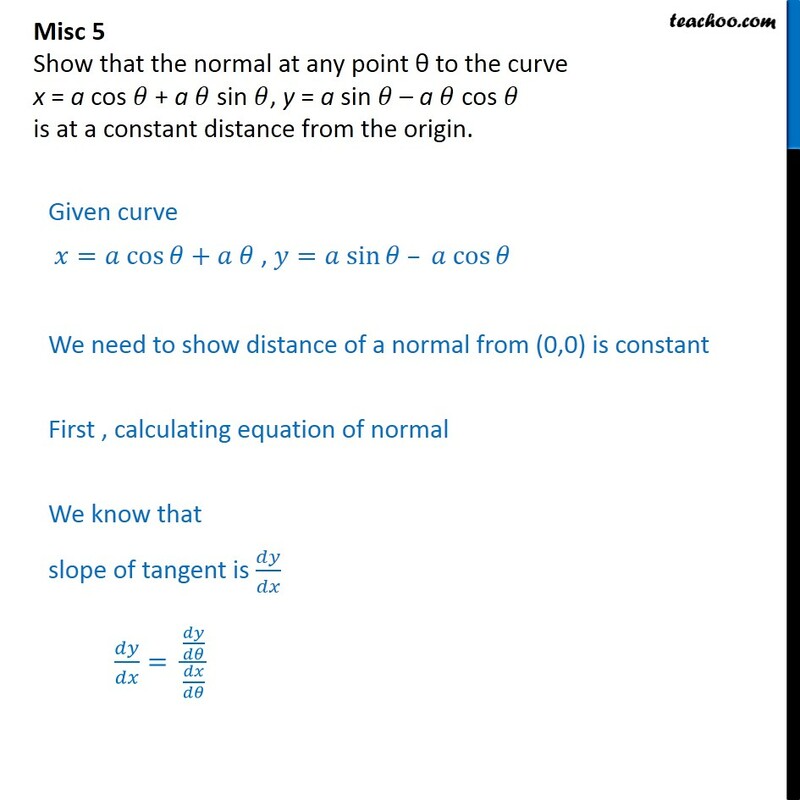 Given curve = cos + , = sin cos We need to show distance of a normal from (0,0) is constant First , calculating equation of normal We know that slope of tangent is = Given = cos + sin Diff. 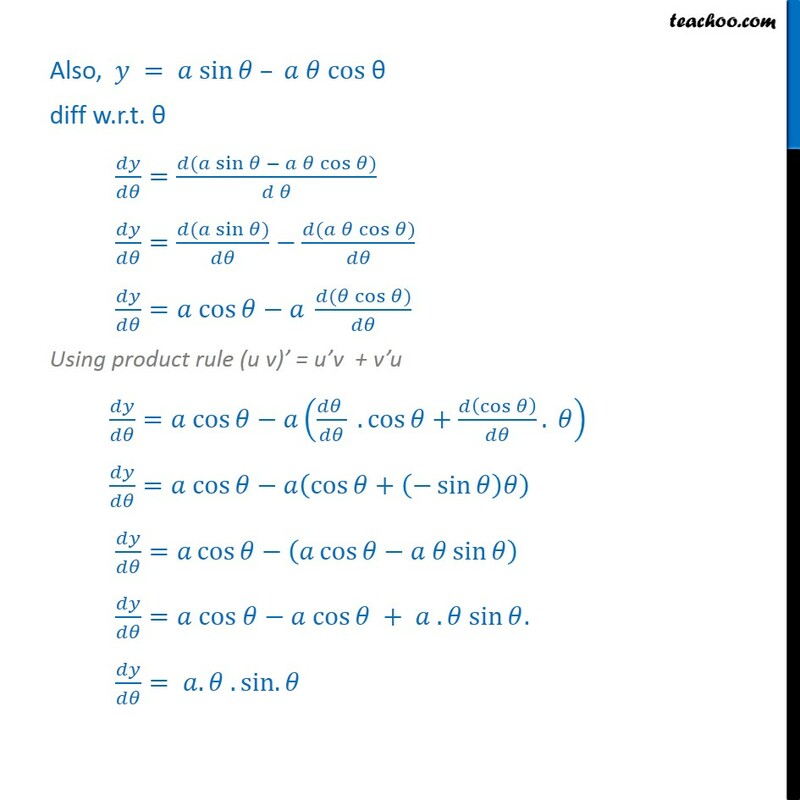 w.r.t = cos + sin = ( cos ) + ( sin ) = sin + ( sin ) Using product rule (u v) = u v + v u = a sin +a sin + ( ) = + + . 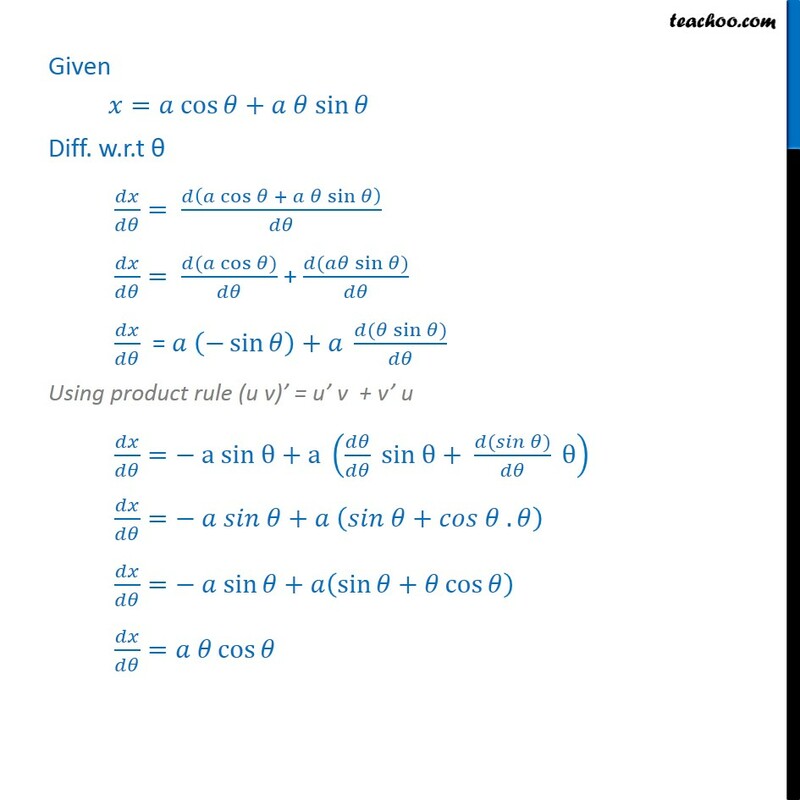 = sin + sin + cos = cos Also, = sin cos diff w.r.t. = ( sin cos ) = ( sin ) ( cos ) = cos ( cos ) Using product rule (u v) = u v + v u = cos . cos + cos . = cos cos + sin = cos cos sin = cos cos + . sin . = . .sin. 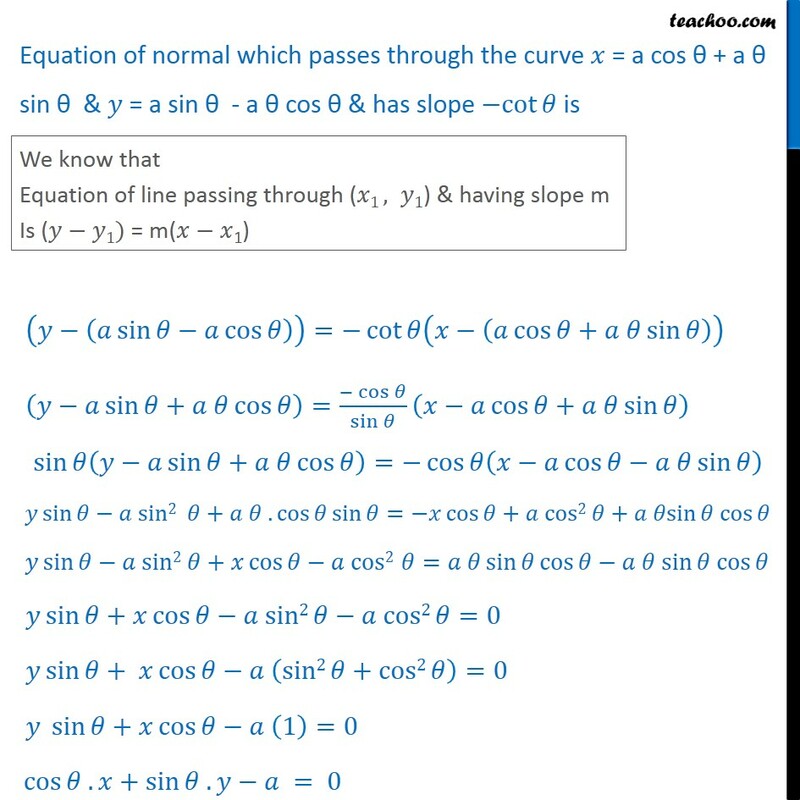 Now, = = sin cos = sin cos = tan We know that Slope of tangent of Slope of normal = 1 tan Slope of normal = 1 Slope of normal = 1 tan Slope of normal = cot Equation of normal which passes through the curve = a cos + a sin & = a sin - a cos & has slope cot is sin cos = cot cos + sin sin + cos = cos sin cos + sin sin sin + cos = cos cos sin sin sin2 + . cos sin = cos + cos2 + sin cos sin sin2 + cos cos2 = sin cos sin cos sin + cos sin2 cos2 =0 sin + cos sin2 +cos2 =0 sin + cos 1 =0 cos . +sin . 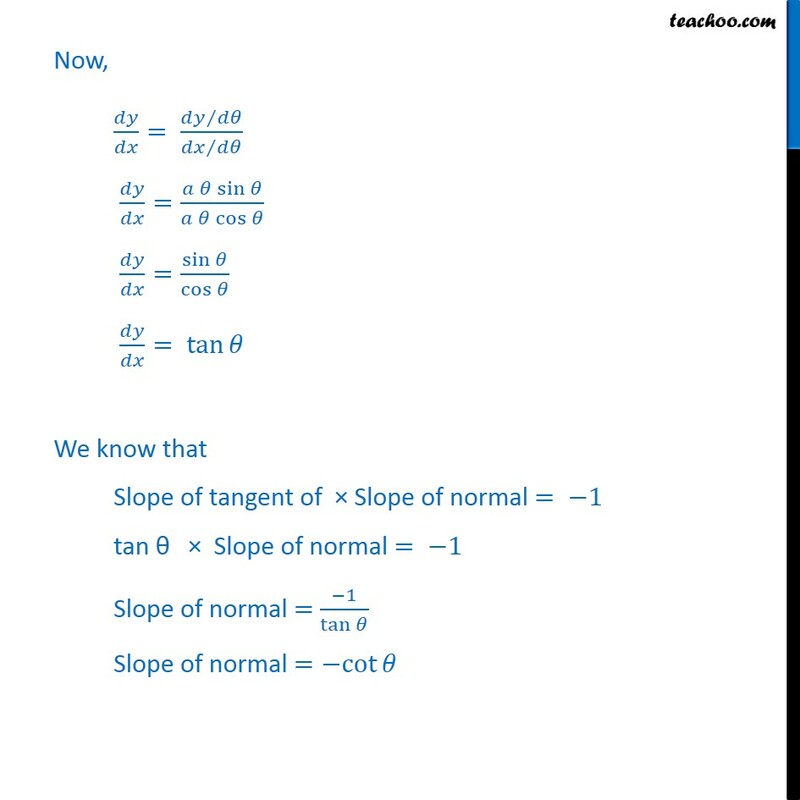 = 0 Thus, equation of normal is cos . + sin . 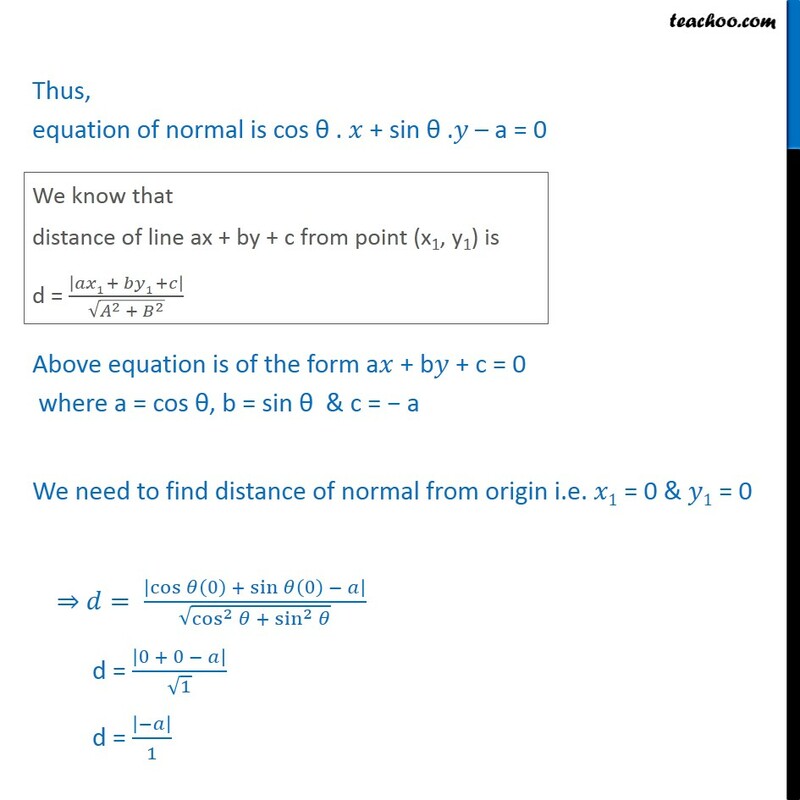 a = 0 Above equation is of the form a + b + c = 0 where a = cos , b = sin & c = a We need to find distance of normal from origin i.e. 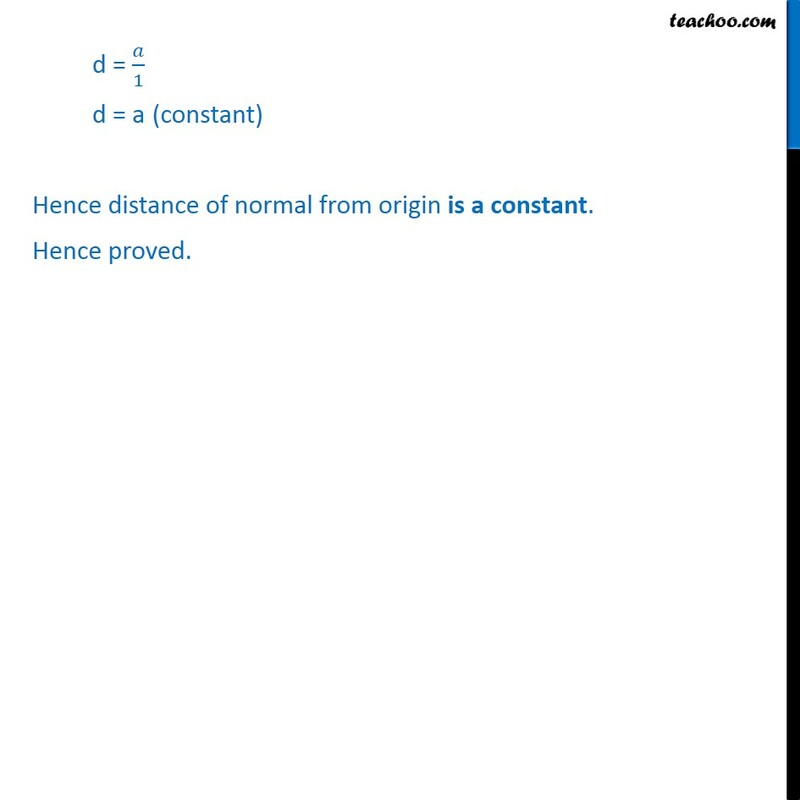 1 = 0 & 1 = 0 = cos 0 + sin 0 cos 2 + sin 2 d = 0 + 0 1 d = 1 d = 1 d = a	(constant) Hence distance of normal from origin is a constant. Hence proved.